Missouri at one time hosted several Native tribes, but today, none remain. 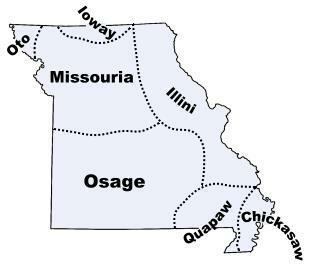 The Illini, Missouri, Osage and Quapaw were the primary tribes with the Chickasaw occupying the far southeast corner, the Ioway the northern border and the Otoe the far northwest corner of the state. This map is from the www.native-labnguages.org site. All of these tribes were removed to Oklahoma. A few Missouri Indians were reported to have escaped during the removal. Of course, others may have married into white families earlier and avoided removal in that fashion. When transcribing records from the WWI draft registration of people who are designated as Native, two things indicate a Native population. First, if I see repeated occurrences of a particular county that is not a major population center. For example, St. Louis, MO would never raise my eyebrows since is it a major city and people from many locations would flock there. However, repeated occurrences of a county with no major city would likely indicate a Native population group living there, whether as a tribe or simply as a group of descendants. Second, if I see repeated occurrences of specific surnames. This indicates a family group, especially if they are found in the same county. In Nebraska, recently, I found both of these conditions, and sure enough, when I checked on Thurston County, where many Native people claimed as home, I discovered that the Winnebago and Omaha tribes both have reservations there. Neither of these conditions existed in Missouri, but still, they had quite a few people who registered as Native. If these people were not part of a tribal group, who were they and where did they come from? Other tribes crossed Missouri on their forced march, known at the Trail of Tears, in the 1830s while being removed to Oklahoma. In particular, the Cherokee were housed on the east side of the Mississippi during the winter of 1838, many freezing and starving, and crossed into Missouri in the spring of 1839. Later records show that many fell ill and were left along the way. Many, but not all, died. Some of the 1918 draft registrants are likely their descendants. Not everyone indicated a place of birth, but some did. The draft forms varied and not every edition of the form asked that question. However, of the 259 total individuals who registered for the draft in Missouri as native born Indian, a whopping 51.35%, or 133, were Mexican. This is a surprisingly high number, especially for a state in the geographic center of the US, not near the Mexican border. These 133 people of Mexican descent either indicated Mexico as their birthplace, listed their race as Mexican/Indian or Latino or had an unquestionably Spanish name. So it appears that while the tribes native to Missouri were removed and their lands confiscated in the 1830s, some 80-90 years later, Indians were still present in Missouri, not as an organized tribe, but remnant peoples, half of whom were immigrant Indians from Mexico. This entry was posted in Chickasaw, Illini, Ioway, Missouria, Osage, Otoe, Quapaw. Bookmark the permalink. Interesting, having recently read an article describing the state-name pronunciation … in St. Louis it is Missour-ee, in Kansas City, Missour-ah. The tribal name, Missouri, would indicate it is Missour-ee-ah … though KC (where I am) pronounces it perhaps closer. Incidentally, I discovered there is an archeological site quite close to where I live, where a Powwow is held each autumn, the artifacts indicate Hopewell connections!